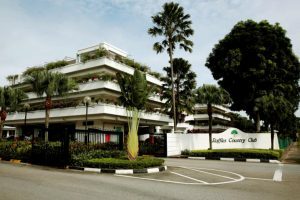 Despite lingering uncertainty over the Kuala Lumpur–Singapore High Speed Rail (HSR) project, the Government on Wednesday (Aug 1) proceeded with its acquisition of the land that Raffles Country Club (RCC) sits on. In January 2017, the Government announced that RCC would be the second club after Jurong Country Club to make way for the HSR’s facilities. The site will also house the future Cross Island Line’s (CRL) western depot. The club, which opened in 1988 and is one of Singapore’s oldest, was to hand over the land to the Singapore Land Authority on July 31 (Tuesday) – 10 years before its 30-year lease was due to expire in October 2028. However, developments in Malaysia after the election of a new government led by Dr Mahathir Mohamad have left the fate of the HSR project in doubt. With Malaysia’s national debt at RM$1 trillion (S$335 billion), Dr Mahathir said in July that his government would negotiate a deferment of the rail link to avoid paying compensation to Singapore if the project was scrapped. Malaysian Economic Affairs Minister Mohamed Azmin Ali said this week that the meeting between both countries to discuss the project would likely take place in August. Responding to TODAY’s queries, a Singapore Land Authority (SLA) spokesperson confirmed that the Government “took site possession of Raffles Country Club’s land on 1 August 2018”. However, the SLA spokesperson noted that a temporary license has been granted to the club from Aug 1 to January 31 next year so that RCC can use its existing clubhouse, golf buggy area, bin centre, maintenance complex and 24 carpark lots to “facilitate the winding down of its operations and disposal of assets”. RCC stated on its website that the club’s “critical staff”, including its general manager and finance manager, as well as employees dealing with membership and facilities would remain till January 2019. It is unclear whether other employees such as frontline staff and cleaners will remain, or if they have received assistance in applying for jobs elsewhere. The club’s General Committee president Paul Singh could not be reached for comment on Wednesday. Club members expressed sadness over RCC’s closure, and said they would miss its iconic lakeside golf course, which “could not be found anywhere else” in Singapore. But they were understanding, as they knew that the land was still needed for the Jurong Lake District development regardless of whether the HSR project went ahead. Retiree Loh Yoke Peng, 53, who has been a member for 15 years, said the club’s closure would not affect golfers as there are “too many golf courses” here. Mr Patrick Kwek, a 69-year-old retiree who has been a member since the club’s founding, noted that club was like a “second home” to him as he played golf there about two to three times a week. He said that there have been more events in the weeks leading up to the club’s closure such as reunion golf games and dinner parties. Mr Kwek and some members also organised a farewell lunch for some of the club’s frontline staff at Indian restaurant Samy’s Curry a few weeks ago, as he said “they have helped us a lot over the years and we share a bond”. With the Malaysian government yet to confirm its position on the HSR project, there had been calls from RCC members to review the club’s acquisition. When asked why SLA had proceeded with the acquisition despite the uncertainty, its spokesperson referred to National Development Minister Lawrence Wong’s response in Parliament on July 9, where he noted that plans to develop the Jurong Lake District – including the land set aside for the construction of the HSR project – are still relevant. Mr Wong had said that the plans include developing a commercial precinct, building up to 20,000 new homes, and setting up a major transport hub connecting existing and upcoming MRT lines. Jurong Country Club’s former site, which was acquired at the end of 2016, will be used for new mixed-use developments and community facilities, while the Raffles Country Club site is required for the Cross Island Line’s western depot and other transport related uses. Previously, the authorities said that RCC – over twice the size of Jurong Country Club – was deemed most suitable to run HSR tracks at ground level before it goes underground towards the Jurong East Terminus. Initially targeted for a Dec 31, 2026, opening, the HSR would take travellers from Singapore to Kuala Lumpur in 90 minutes.